Run the sample app on your device or emulator. Select GoogleSignInActivity from the main screen. Click the Sign In button to begin. Go to the Facebook Developers Site and follow all instructions to set up a new Android app. When asked for a package name, use com.google.firebase.quickstart.usermanagement. When asked for a main class name, use com.google.firebase.quickstart.usermanagement.FacebookLoginActivity. Open the file app/src/main/res/values/ids.xml and replace the value of the facebook_app_id with the ID of the Facebook app you just created. Run the app on your device or emulator. Select the FacebookLoginActivity from the main screen. If you see text that says Facebook is disabled, make sure you are running either the facebookDebug or facebookRelease variants of this sample. Go to the Twitter Developers Site and click Create New App instructions to set up a new Android app. Go to the Keys and Access Tokens tab of your app and copy the Consumer Key and Consumer Secret. Enter your Twitter Consumer Key and Consumer Secret and click Save. Copy the callback URL from the bottom of the panel (Ex. 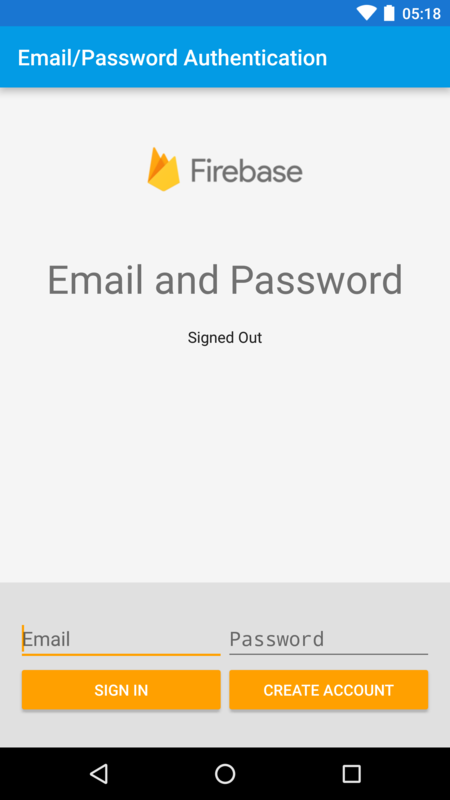 https://<your-app-id>.firebaseapp.com/__/auth/handler). Navigate back to your Twitter app settings on Twitter Developers Site. Click the Settings tab and paste in the callback URL from the Firebase console. Open the file app/src/main/res/values/ids.xml and replace the value of the twitter_consumer_key and witter_consumer_secret with the key and secret you just put into the Firebase console. Select TwitterLoginActivity from the main screen. Click the Log In with Twitter button to begin. Under Authorized Domains click Add Domain and add auth.example.com. Select EmailPasswordActivity from the main screen. Fill in your desired email and password and click Create Account to begin. Click Email/Password and turn on the Enable switch. Turn on the Email Link (passwordless sign-in) switch, then click Save. Replace your-project-id in the AndroidManifest.xml file with your project ID. Select PasswordlessActivity from the main screen. Fill in your desired email and click Send Link to begin. Click Phone and turn on the Enable switch, then click Save. Select PhoneAuthActivity from the main screen. Enter your phone numeber and click Verify to begin. Click on the Service accounts tab in the left. Click on the Create Service Account on the top. Enter desired service account name and click on the Create button. Once the serivce account is created, click on the Options. Choose JSON as the key type then click on the Create button. Open the file web/auth.html using your web browser. Copy the text from the ADB Command section. This will be required later on. Run the Android application on your Android device or emulator. Select CustomAuthActivity from the main screen. Run the text copied from the ADB Command section of the web page in the steps above. This will update the Custom Token field of the running app. Click Sign In to sign in to Firebase User Management with the generated JWT. You should see the User ID you entered when generating the token. Go to the Microsoft Developer Console and navigate to your app. In the "Application Secrets" section click Generate New Password and copy the result. Enter your application ID and application secret (password) from the previous step. Add the redirect URL from the Firebase console under Platforms > Web. Select GenericIdpActivity from the main screen. Hit the sign in button and proceed through the login flow.